He was shot three times and has a broken leg from the stampede of people rushing out of the club, but Angel Colon of Winter Haven still managed to flash a smile as he spent more than an hour talking to the media Tuesday morning. “If it wasn’t for you guys I definitely wouldn’t be here,” he said, referring to the medical staff that joined him at the press conference at the Orlando Regional Medical Center. 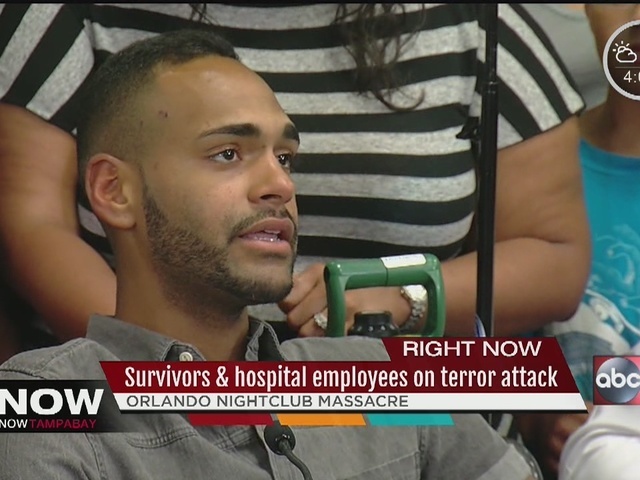 His voice began to shake as he spoke about the chaos inside the Pulse nightclub in Orlando, Florida. “I’m just laying down and I’m thinking I’m next, I’m next, I’m dead. I don’t know how but by the glory of God he shoots towards my head but it hits my hand. And he shoots me again and it hits the side of my hip,” Colon said. Angel’s angel: A police officer who came in and dragged him to safety. “He drops me off across the street and I look up and there’s just bodies everywhere and we are all in pain,” he said. Doctors told reporters that what undoubtedly helped save lives that night is that the hospital is only four blocks away. “They were being dropped off in the truckloads and in ambulance loads,” said Dr. Kathryn Bondani, one of the emergency room physicians. The doctors train for mass casualty events, and they’re prepared to triage patients in hallways, but nobody expects the biggest mass shooting in U.S. history to happen on your watch, and in your town. “This was somewhat of a surreal experience,” said Dr. Will Havron. 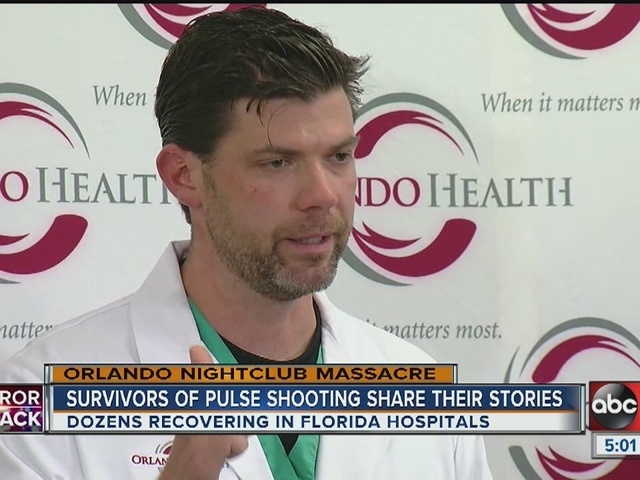 According to the latest numbers, 44 patients from the night club went through the doors at the Orlando Regional Medical Center. Doctors managed to save 35 of them. At least six are still in critical condition. The agony shook even the most veteran doctors. “I was on call again last night and I was walking out of the hospital and walking out I saw team members walking into work crying,” said Dr. Chadwick Smith. Colon still has a long road to recovery ahead, telling reporters he has no plans to ever return to that nightclub, but he won’t let the shooter steal his innocence, either.